You can choose different types of payment. The safety of Credit Card payment is guaranteed by the intercontinental Paypal circuit that ensure the highest safety levels and the most strict cryptographic protocols of the market. On the purchasing procedure, you will be able to use either your Paypal account or any credit card accepted, even without having a PayPal account. Your personal datas will be treated safely in an external procedure and won't be reveiled to anyone, including Vinity.it website. Your order will be processed immediately after receiving the payment on our bank account. It's exclusive of shipments in Italy (the charge for this service is € 4.99). The express courier which deliveries the goods will accept only payment in cash. Vinity.it is also an Aicel website, an italian e-commerce association which supervise the italian market in order to guarantee the correct and ethical conduct of its associates, giving the web users an even safer and more enthusiastic shopping experience! Thanks to the partnership with the best express couriers such as UPS and SDA, all shipments are fast and insured. You will receive your order usually within 24/48 hours in Italy, and 3-4 days troughout all Europe. The maximum quantity abroad is 12 bottles. Shipping prices may differ on addresses like small islands and remote areas which are classified as "remote" by the express courier. We examined different professional solution dedicated to wine shipping, performing real crash-test in order to verify which should be the most effective solution, using real wine bottles filled with water. Our preference of choice fell on the styrofoam pack, the best in absorbing possible impacts and preserving the temperature for a long time. Furthermore it's also 100% recyclable. 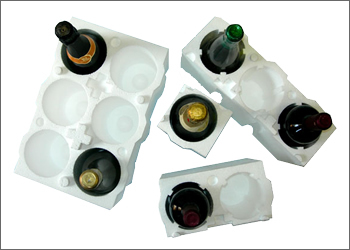 However we may have to use special reinforced carton boxes for specially shaped bottles like the "Champagne reserve" bottles (large based). Every shipment is always guaranteed and insured. Just one general recommendation if we may: always indicate as your shipment address a place where our express courier can easily find someone during the worktime hours. Nobody home? Put your workplace address if possible, or a neighbour/relative nearby, or even a trusted shop, a bar, anywhere you wish as long as it's open all day long.